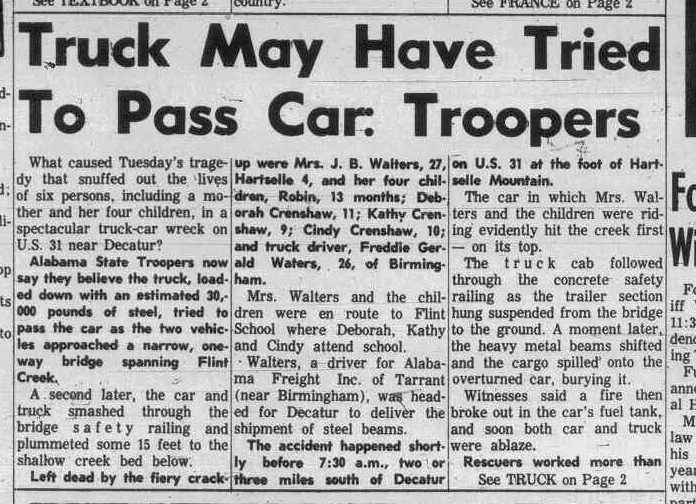 Below is the Tuesday afternoon edition of the Decatur Daily reporting the Tragedy. Also included is some additional information from the Thursday edition of the paper for that week. Mrs. Graves' 2nd Grade Class was featured in a Daily follow-up article in March. Click HERE to read the 2nd Grade article in the Daily. In 1965 I was nine years old, in Mrs. Monroe’s Third Grade Class at the new Flint Elementary School in Flint City, Alabama. I remember most of the names and can still recall the faces of my classmates from that year. One of my classmates was Cathy Crenshaw. I can’t say that I knew Cathy well but I remember that she sat in a desk in the second row from the classroom door, about five seats back from the front. Right behind Carolyn Peden. She was of slender build with short brown hair and a freckled face. I remember seeing her and many of the other girls from school wearing their Girl Scout uniforms (Brownies) on special meeting days. 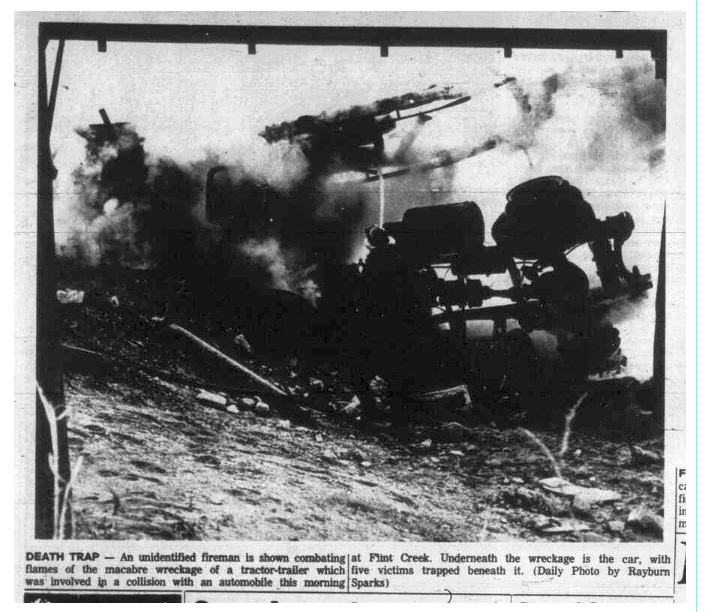 I will never forget the events of Tuesday, February 23 of that year. If you speak to anyone who attended our little school (1-6 Grades) during that year, they will probably remember that day, too. That is the day that Cathy died in a terrible automobile accident that took not only her life but the lives of her Mother and all of her sisters. 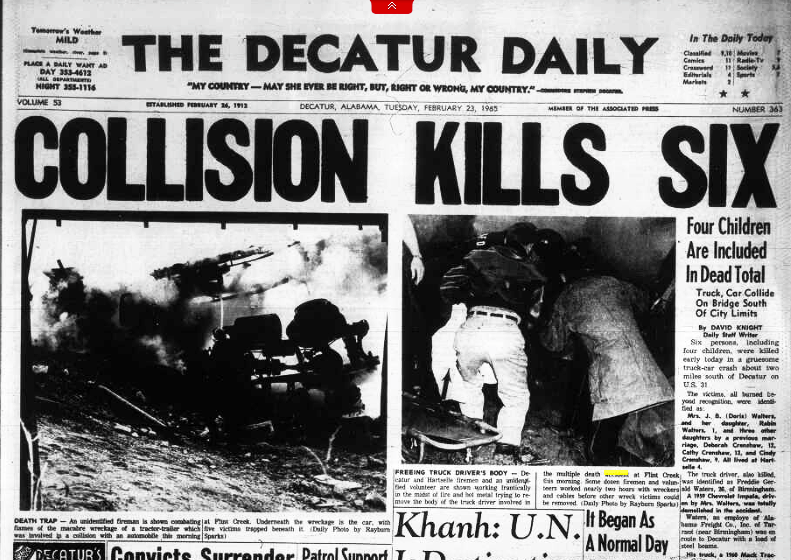 I have looked back through the Decatur Daily archives to find stories about the crash. I remember reading them after school the week of the crash. Here are the articles that I found. If you know more about the incident, please let me know. If you have photos of any of the Crenshaw girls I would love to see them. I have written a fictional short story based on the terrible tragedy at the bridge in Flint entitled The Rescue.